Accepted Scientific Name: Echinocereus coccineus Engelm. in Wisliz. Mem. Tour N. Mexico [Wislizenus] 93, adnot. 1848 [Apr 1848] Wisliz., Wisliz., Wisliz. Echinocereus coccineus var. gurneyi HK 1064 (Collector Horst Kuenzler) Locality: Brewster County, Texas, USA. Altitude: 1200-1500 metres above sea level. Habitat: It grows on rocky hillsides, on exposed slabs and fractured limestone rock in pine-oak-juniper woodlands and often associated with Dasylirion leiophyllum, Escobaria guadalupensis, Echinocercus viridiflorus var. cylindricus, and Agave neomexicana. Echinocereus coccineus Engelm. in Wisliz. Echinocereus arizonicus subs. nigrihorridispinus W.Blum & Rutow in W.Blum et al. Cereus aggregatus (Engelm. ex Emory) J.M.Coult. Echinocereus aggregatus (Engelm. ex Emory) Rydb. Escobaria aggregata (Engelm. ex Emory) Buxb. Echinocereus coccineus var. kunzei (Gürke) Backeb. Echinocereus rosei Wooton & Standl. Echinocereus engelmannii subs. decumbens (Clover & Jotter) W.Blum & Mich.Lange in W.Blum et al. Echinocereus paucispinus var. hexaedrus (Engelm. & J.M.Bigelow) K.Schum. Echinocereus triglochidiatus var. toroweapensis P.C.Fisch. Echinocereus coccineus subs. paucispinus (Engelm.) W.Blum, Mich.Lange & Rutow in W.Blum et al. 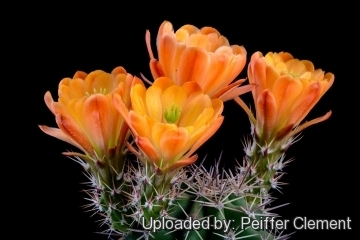 Description: Echinocereus coccineus var. 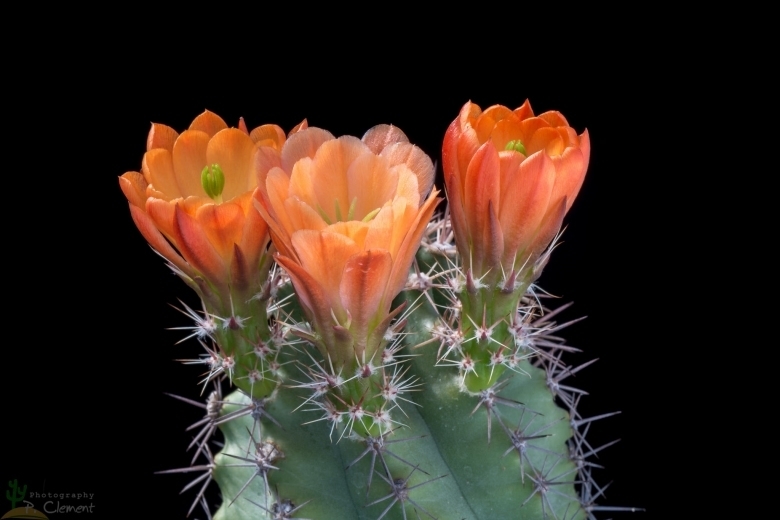 gurneyi is a nice cactus species characterized by short spines and orange-red flowers. It is a variety of doubtful validity, generally included in Echinocereus coccineus. 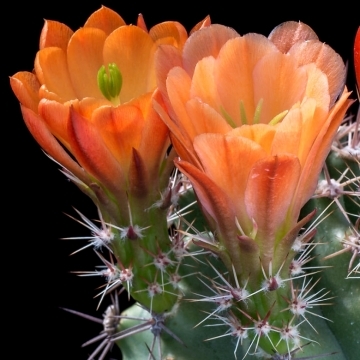 However, some authors, consider this plant the result of introgression of Echinocereus dasyacanthus into Echinocereus coccineus (a naturally occurring hybrid) as suggested by relatively subtle features, such as orange instead of red flowers, higher rib number, and shorter spines and is often treated under ICBN rules as a synonym of the nothotaxon Echinocereus x roetteri. 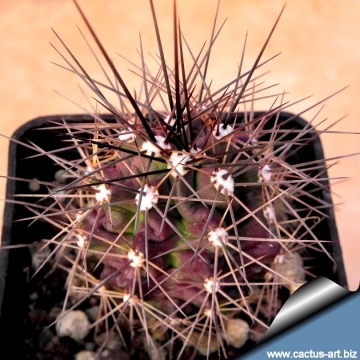 Habit: It is a low growing cactus species, usually clumping often in colonies of 10 stems or more. Stem: 20-35 cm long, 5-10 cm in diameter, darker green in color compared to the other varieties. Ribs: (8-)10 -11(-12), not markedly tuberculate. Spines: Mostly undifferentiated between radials and centrals. Central spines: 1 (occasionally 2), up to 7,5 cm long and 0,5 mm in diameter. Flowers: Paler than the type, orange-red or salmon pink, up to 8 cm in diameter. Blooming season: April-May, open day and night. Fruiting 2-3 months after flowering. Echinocereus arizonicus subs. matudae (Bravo) Rutow: has larger stem, up to 50 cm tall, and 12 cm in diameter, a reduced number of ribs with fewer short, thick spines. Distribution: Mexico, Chihuahua. Echinocereus coccineus Engelm. in Wisliz. : It has stems that are 2,5 to 5 cm thick, with 8 to 11 ribs. The spines are not differentiable between centrals & radials. There are 0 to 4 central spines and 5 to 20 radial spines per areole. The red-orange flower is 7-8 cm across, and the stigma has 7 or 8 lobes. Echinocereus coccineus var. gurneyi (L.D.Benson) S.Brack & K.D.Heil: Stems darker green in color compared to the other varieties, and 10 cm thick. The flowers are Orangish-red. This variety is often included into the 'coccineus' subspecies. It looks like coccineus, but is very clustering! Echinocereus coccineus subs. paucispinus (Engelm.) W.Blum, Mich.Lange & Rutow in W.Blum et al. : It has stems that are about 6 cm thick, with 5 to 8 acute narrowly furrowed ribs that have areoles that are spa ced 0,5 to 1 cm apart. It has 0 or 1 central spine, 1.4 inches long, and 3 to 6 radial spines that are curved and straight. The flower is red with a hint of orange & shaped like a funnel about 5 cm long, having 7 lobes of the stigma. Cultivation and Propagation: Echinocereus coccineus var. gurneyi is fairly easy to grow. It makes great potted specimens. Soil: Use a mineral well permeable soil with little organic matter (peat, humus). It grows in limestone areas of Texas (Big Bend area) and adjacent areas of Mexico, so will probably benefit from extra calcium in its soil. Growth rate: It grows well, though slowly, but it possible to increase the speed of growth to some extent by providing adequate amount of water, warmth, and a liquid fertilizer diluted half strength during the active growing season, but it’s susceptible to rotting if too wet. Most plants will offset readily, and clumps can be produced in a few years. Soil: It needs a very porous, slightly acidic potting medium (add pumice, vulcanite, and perlite). Outdoors it does well on poor, rocky soils. Exposure: It likes a sunny position also blasting sun in summer. If grown indoor provide 4 to 6 hours, or more, direct morning or afternoon sun. 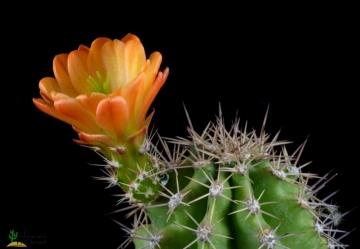 Watering: It is sensitive to overwatering (rot prone) needs a very good drainage to avoid rotting, but requires more moisture than true desert cacti to grow and produce flowers. Hardiness: It its natural environment it is very cold resistant from -10° to -25° C (depending on clones) or less for short periods of time. It can be grown outdoors in Mediterranean warm-temperate climates, But for safe cultivations needs anyway to kept above 5 °C and dry in winter. But it can tolerate temperatures down to -5° C (or even less) for very short periods if very dry and ventilated. During winter month, put them in a cool luminous place and encourage them to enter winter dormancy by withholding water and fertiliser over the winter as they will etiolate, or become thin, due to lower levels of light. Maintenance: Repot every two years. Needs lots and lots of space to grow, use large shallow container or bowl filled with very porous compost. It like pots with generous drain holes. 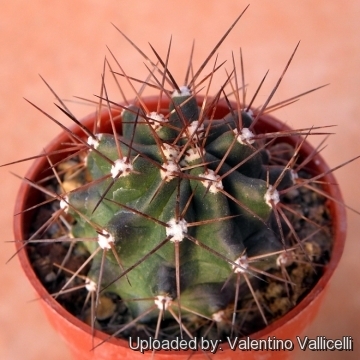 Pest & diseases: They are susceptible to fungal diseases if overwatered, but are not nearly as sensitive as many other cacti, especially in warm weather. If kept damp through cold periods, they will invariably suffer. Garden uses: It is a fine plant for a rock garden or container, contrasts well with agaves, yuccas, and low-growing flowering plants. Grafting stock: The taller fast-growing forms of Echinocereus coccineus and of Echinocereus triglochidiatus are highly recommended stocks for grafting cold hardy type cactus species. These can be used as cold hardy type stocks for almost all types of cactus, while still retaining the original natural grown look to the scion. Edible uses: The fruit can be consumed fresh or preserved. Propagation: Seeds, also can be grown from cutting as it branches from the base. The seeds may be germinated and grown in containers. Their main requirements consist of high humidity levels, free-draining soil mix, and enough water, light, and nutrition.